And my instructions were something with vanilla and chocolate. Okey dokey. 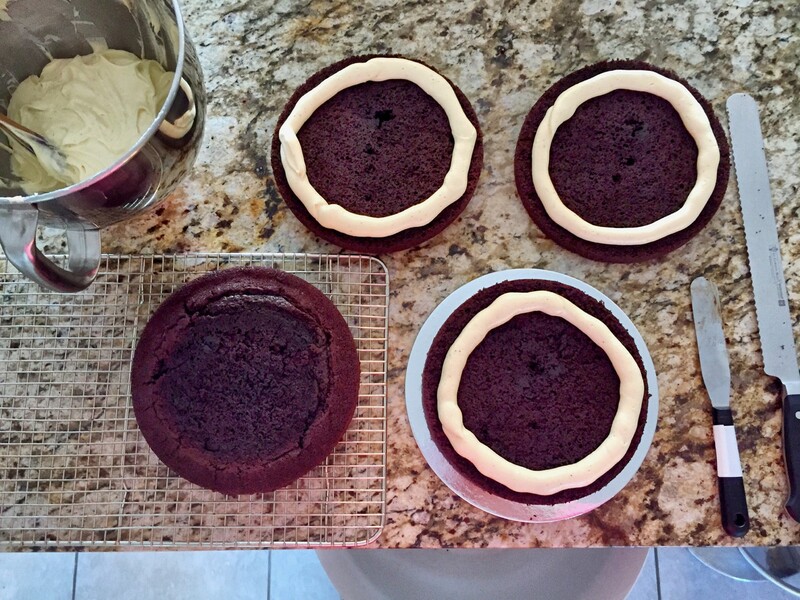 So I decided I would make her a Grand Marnier Chocolate Cake with Vanilla & Cream Cheese frosting. 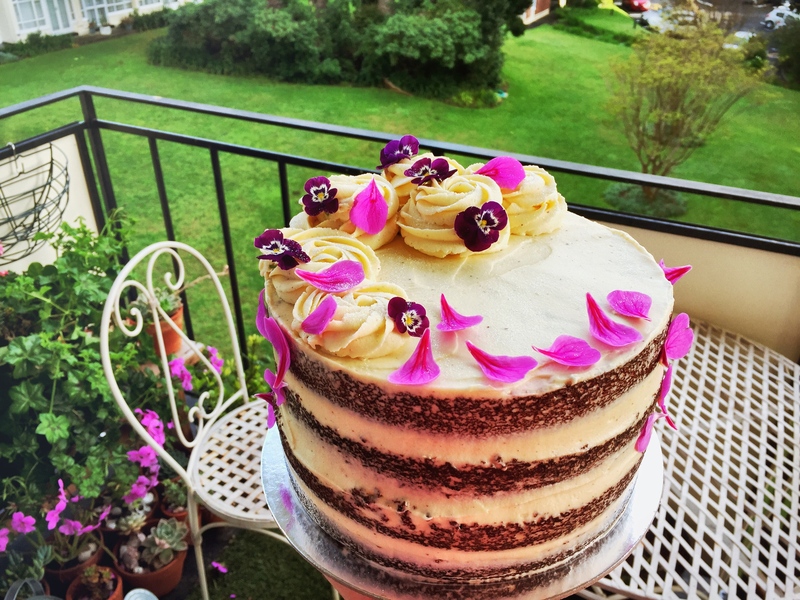 So I baked my go to chocolate cake recipe which is super speedy and easy but always a winner. I think the trick is in the hot espresso. I’ve read a few chocolate cake recipes in the past that have included coffee in various forms and I must admit it really enhances the chocolate flavour and as long as you don’t overdo it you really don’t even taste the coffee. Add some good quality vanilla into the mix and you’re winning. Sift all dry ingredients together and whisk in the muscavado sugar as it is thick and sticky and will never go through a sieve! Whisk together eggs, milk, oil and vanilla. Gradually add the hot espresso a little bit at a time to temper the eggs. Incorporate well. Bake for roughly 30min until a knife comes out almost clean. Do not over-bake this cake or it loses its fudge like consistency. Let it cool slightly in the tin and then turn out onto a cooling rack. While the cake is cooling make your icing. Place the cream cheese into a mixer fitted with a paddle attachment. Beat until soft and fluffy. Add the butter and beat well. Add the vanilla, salt, orange zest, cream and Grand Marnier. Mix well. Carefully and gradually add the icing sugar in small amounts and mix it in on the lowest speed or you’ll end up looking like a Columbian drug lord. You can pop this into a piping bag and store in the refrigerator until needed. 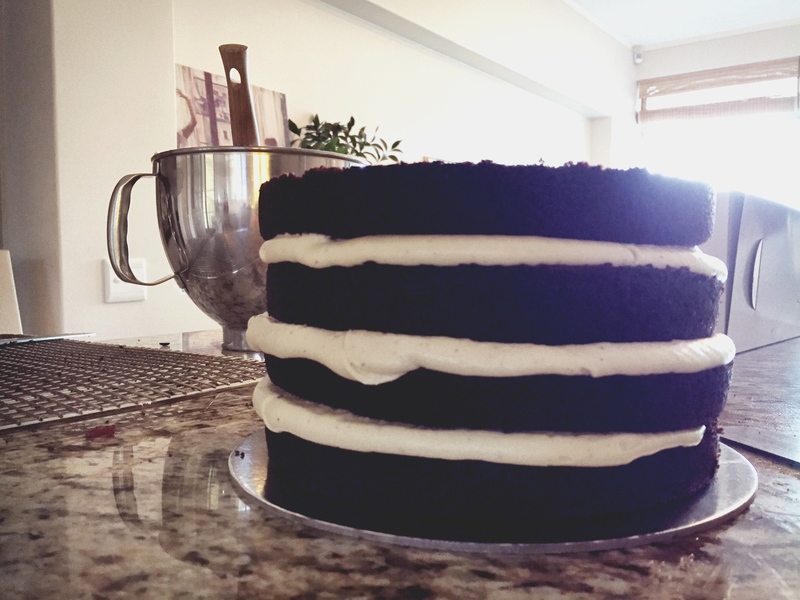 Once the cake has cooled completely use a large serrated knife to slice it horizontally in half. 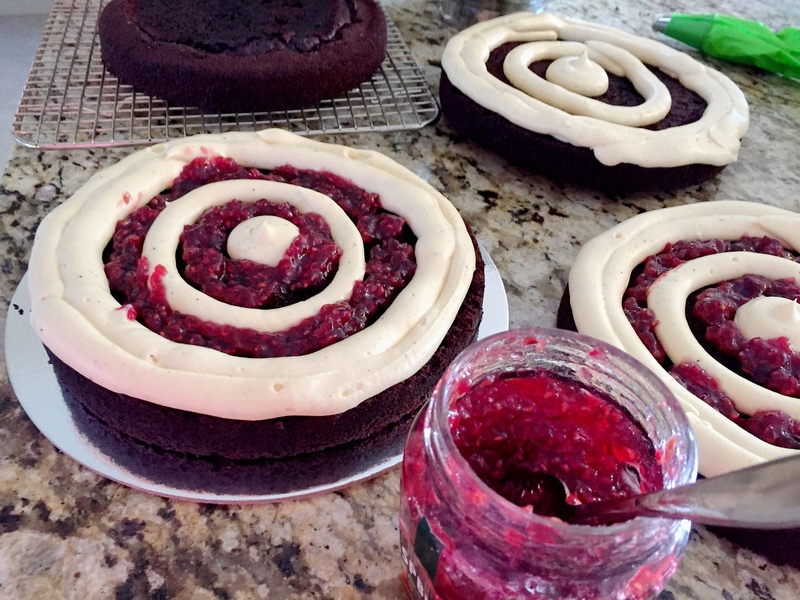 Pipe your cream cheese icing in circles to leave space for the jam. Spoon in the jam. Apricot would work beautifully too! Carefully begin layering your cake. Do not press down as the weight of the layers will do that for you. For your final top layer. if it has too much of a dome slice it flat across so that you have a neater finish. And OF COURSE you get to sample the delicious little crunchy top bit of the cake. Using an off set palette knife pile too much icing onto the top of the cake and start working it down. And you scrape it down and along the sides of the cake you can remove the excess. 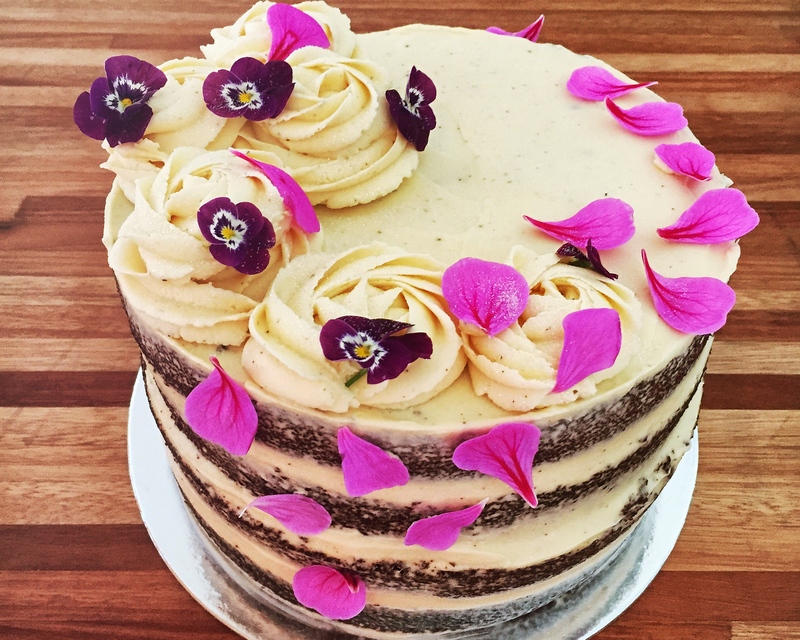 Once your sides and sufficiently covered in a ‘naked cake’ kind of way you can smooth out the top. 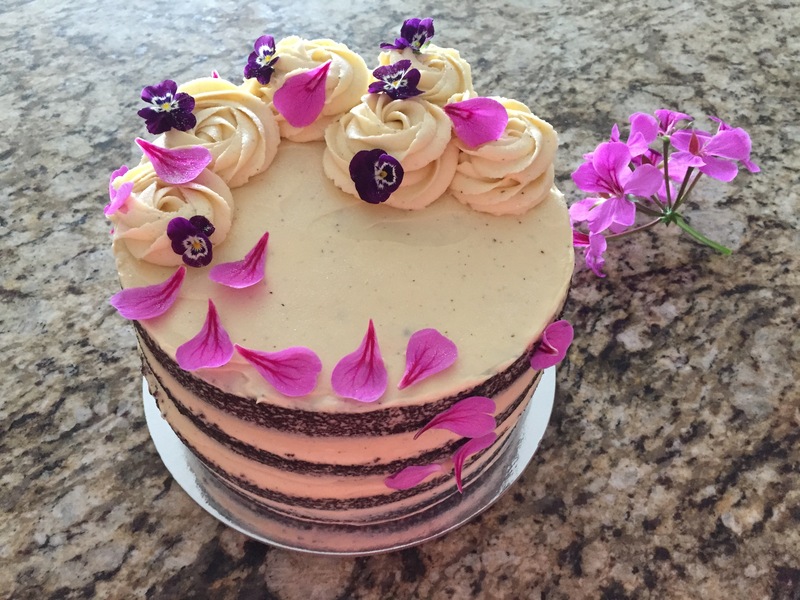 I finished the top off with some swirls of icing and edible flowers from my garden. Et voilà! Let there be cake!